Go Gherkin go….! Sail the Sambar way….a welcome detour from the usual salad or pickle route. This refreshingly flavoured Sambar made from this bright green, smaller version of cucumber variety can be used with steamed hot rice, idli or dosa. Salt to taste 10 gms approx. Wash gherkins, curry leaves and coriander leaves in water. Drain and keep aside. Wash dhal separately in water. Drain and keep aside. Cut each gherkin into 2 pieces lengthwise. Boil dhal and gherkins in a pressure cooker along with water, turmeric powder and ghee. Grate raw coconut. Grind this along with coriander seeds and red chillies, initially without using water and then continue grinding using approx. 50 ml water. When cooking is done and pressure in the cooker has subsided…. Add salt and tamarind paste (refer ingredients list for approx. quantities) Let it boil for a few minutes. Now mix the above ground masala to the cooked dhal and vegetables and continue boiling for another 5 to 10 minutes. At this stage, can you feel the fragrance of sambar? For this, heat ghee or coconut oil in a small skillet. Put mustard seeds. When they crackle, put curry leaves. Switch off the burner. Now add asafoetida and immediately pour over the cooked gherkins sambar. 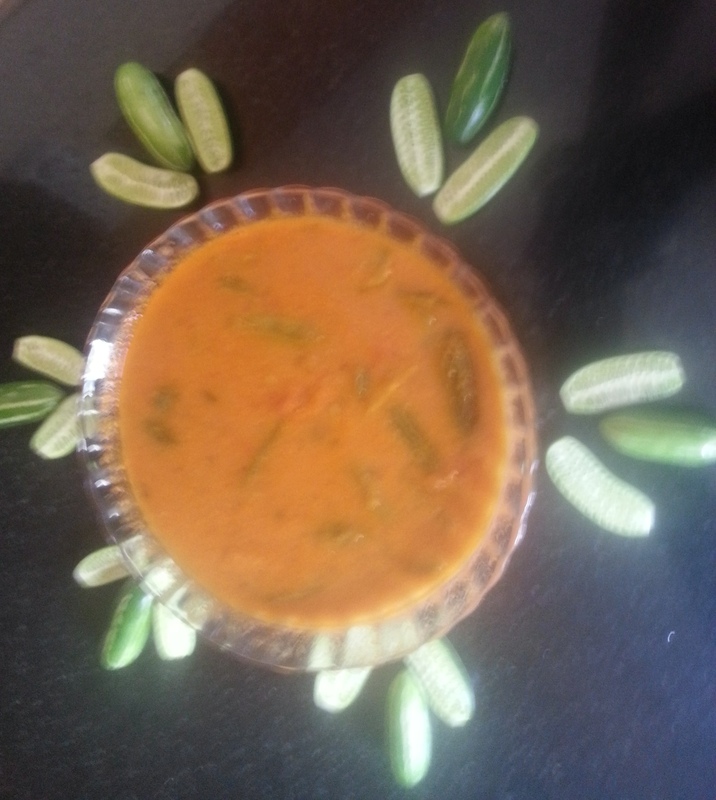 Flavourful Gherkins Sambar is now ready to use! Gherkin, being a condiment vegetable, needs mild and gentle cooking since it loses its intense flavour if overcooked. Did you know? A London skyscraper is nicknamed gherkin due to its resemblance to this fruit.